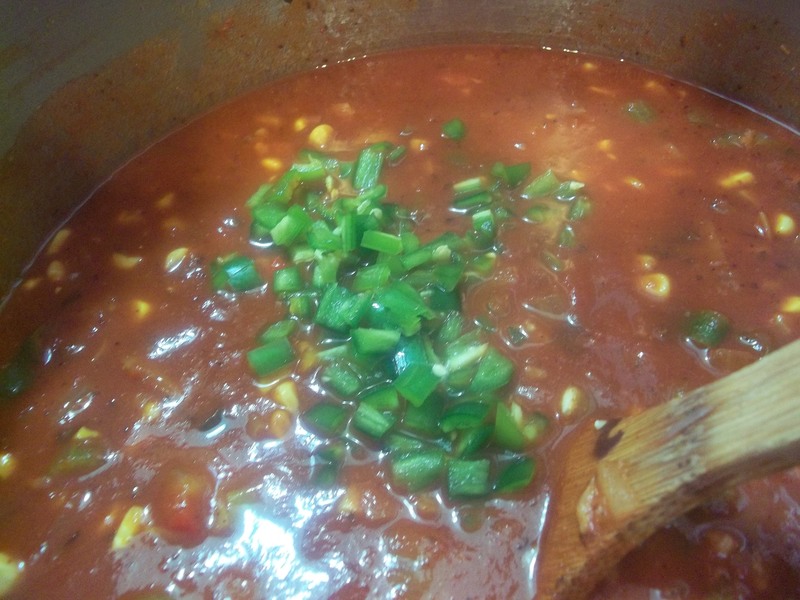 “Hominy beans ya want?” “Hominy math problems ya got left ta do?” “Hominy” has been one of our favorite words around here since I made the Chicken and Green Tomato Pozole. I needed a large can of hominy to finish the stew since pozole traditionally contains hominy, so my husband stopped on his way home from work for me one day to pick some up. He was very helpful and brought home two large cans since I hadn’t specified the amount I needed. So there sat another can. 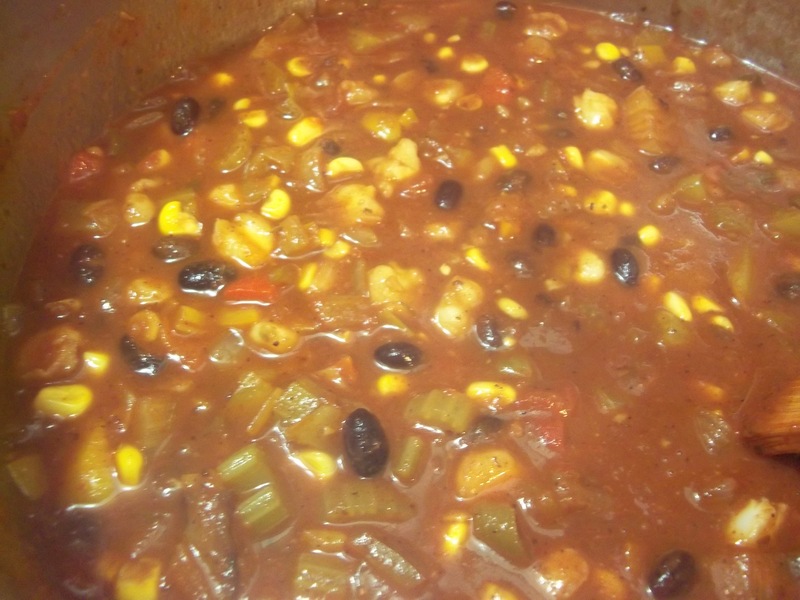 When I decided to make a large pot of vegetarian chili I knew the hominy would be just the thing to bulk it up and keep everyone from missing the meat. I make “real” chili for Christmas Eve dinner with stuffed mushrooms and Red Velvet Cake along with other goodies. This was the menu I grew up enjoying for our family Christmas Eve get together. It’s not Christmas to me without those key dishes. The problem is that chili any other time of year tastes like Christmas. I rarely make it. 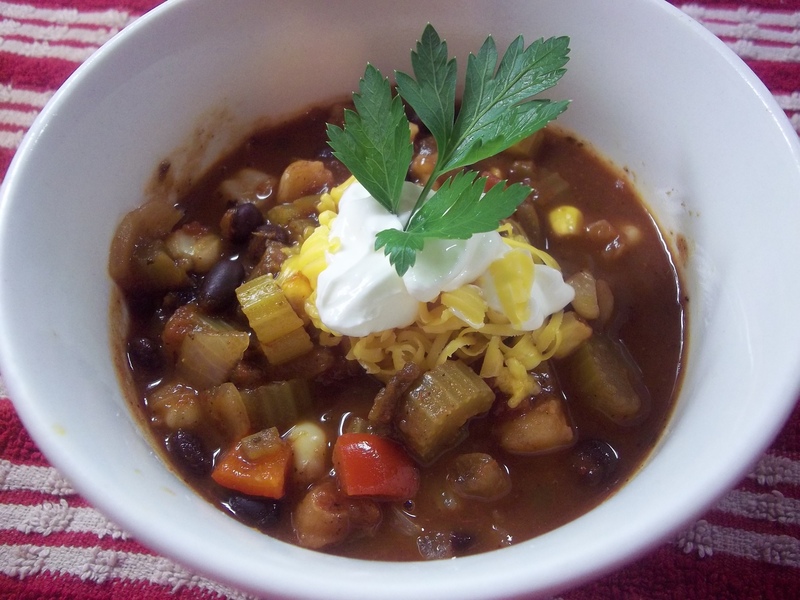 When I first married and moved away from home, however, I made a lot of vegetarian chili. It was always lacking in flavor and texture. 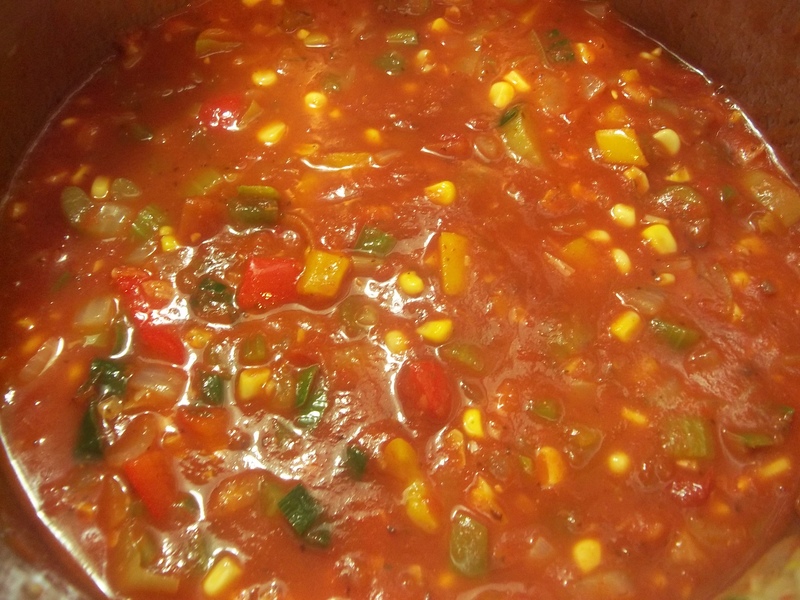 Our Texan friends were horrified to learn that we frequently enjoyed meatless chili. They insisted that chili should be made with Grade A prime steak and nothing else. I didn’t disclose the fact that when I did make it with meat I used ground beef. I didn’t figure they could use a second shock. 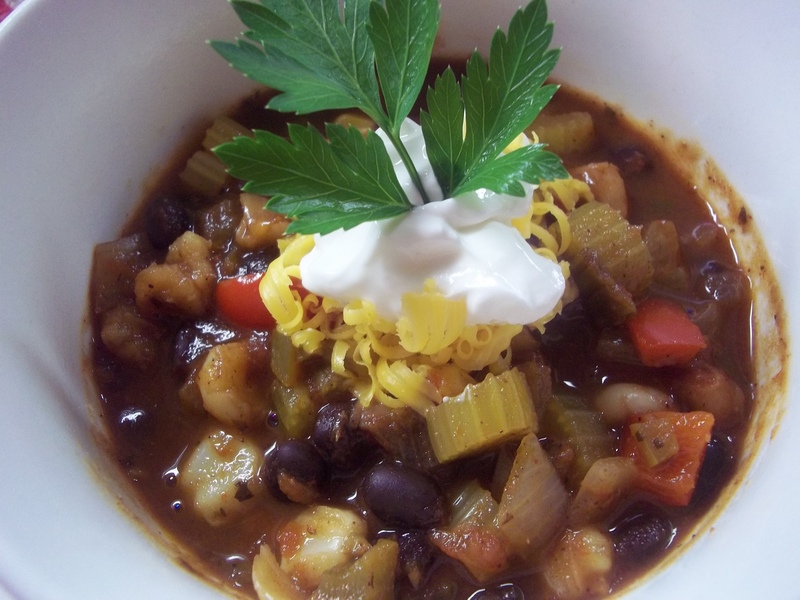 This was definitely the best pot of vegetarian chili I have ever made. There’s something about blogging and “showing your work” that drives you to put extra care and attention into everything you cook. Some things flop and never make it off the drawing board, others are so close to what I imagined that I try again if it wasn’t “perfect” the first time, others effortlessly come together and are beautiful in the end. My favorite part of blogging is that now I have a record of everything I make that’s of any importance to refer to when I want to make the dish again. We are ending up with some family favorites for that reason and my kids love to go to the blog to find their favorite blog foods so I can make them. Cinnabiscuits and Black Gold Fudge are what they usually ask for, but seriously, those dishes are heart attacks waiting to happen so they can’t be recreated very often. I used to worry a lot that if I was blogging, my food had to be fabulous. When my son told me the other day that when he grows up he wants to cook from my blog and that he is glad he will have all of our recipes written down, I realized the plus side to all of my hard work. I am elated when readers comment and praise my recipes; delirious when someone says they used one of my ideas. I think, “Really?! !” But that is nothing compared to the idea of my children wanting to cook from their mom’s recipes in their own homes. I love traditions and starting them is something that makes parenting even more fun. And, heaven forbid, I don’t have the opportunity to live to a ripe old age, my kids will still have a bit of me in my blogging. Heat the oil in the bottom of a large stock pot. Saute the garlic until translucent. 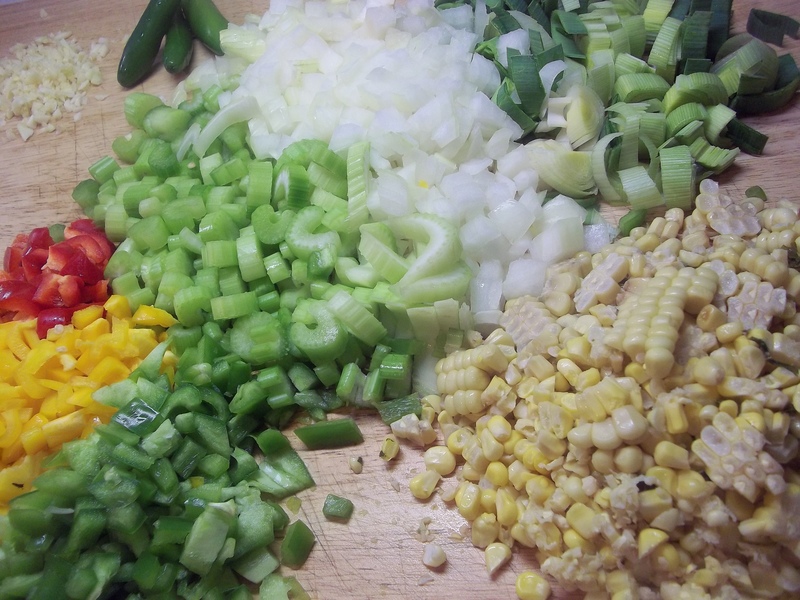 Add the onions, leeks, celery, peppers, and corn. Saute until tender. Add the tomato puree and water. Bring to a simmer. Add 2 tsp. salt, pepper, chili powder, cumin, cinnamon, cocoa, and jalapeno peppers. Cook on a low simmer for 3 to 5 hours. The longer the better for the flavors to meld. Add the black beans and hominy. Season with salt and pepper to taste. Heat through and serve. Note: This is pretty mild chili. What a beautiful story-it brought a tear to my eye. Great photo too. You’ve made the sauce look thick & unctuous. « Annual Gold Rush Days, Dahlonega, GA. “There’s gold in them thar hills!” ~ Dr. M.F. Stevenson.